In terms of assets Barclays’ “S&P 500 VIX Short-Term Futures” ETN is among the leaders in volatility ETFs with around 500 million dollars under management. I suspect it’s also one of the leaders in investor confusion. Although VIX is in its formal name VXXB doesn’t actually track the CBOE’s VIX index with any degree of precision. 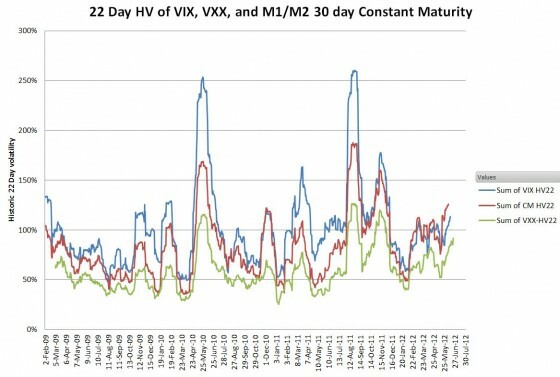 In fact, it’s not unusual for VXXB and VIX to move in opposite directions for a day or two. VXX can’t directly follow the VIX index because nobody has figured out a way to cost-effectively make a market in the VIX index. The best that can be done is to invest in VIX futures—which tend to have a mind of their own. VIX futures come in monthly series that expire the 3rd or 4th Wednesday morning of each month. The next VIX future series to expire is called the first or near month and its settlement value is determined by a special calculation that closely corresponds to the opening quote of the VIX index on expiration day. This is the only linkage between all the various series of VIX futures to the VIX index—a once a month synchronization point with the just expired future. It’s much worse than a stopped clock—which is right twice a day. The VIX index tracks “the market’s expectation of 30-day volatility.” It computes this using a weighted mix of options that are at least 24 days from expiration plus longer dated options. When the near month VIX futures contract expires it closely matches the VIX index value—the 30-day estimate. 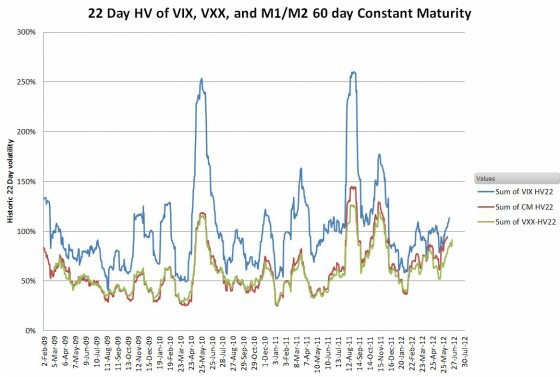 But on that day VXXB has 100% rolled over to the successor VIX futures contracts that have another 30 calendar days before they expire—so VXXB is really providing a weighted maturity volatility expectation of 60 days, not 30. 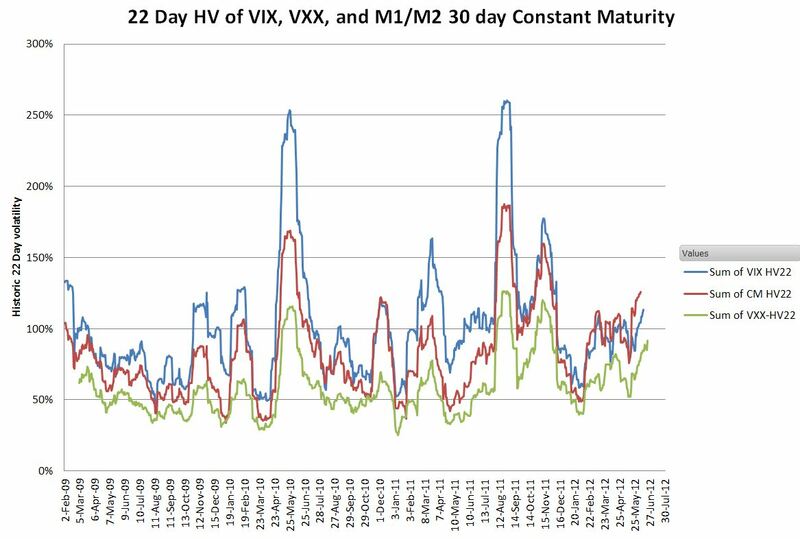 A longer effective maturity would at least partially explain VXXB’s tendency to move about 50% of the VIX index daily moves on average. 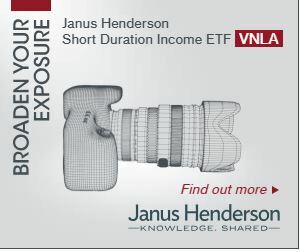 Longer term volatility expectations are less volatile. To verify this analysis I created a spreadsheet that computes average maturity for VIX futures using linear interpolation/extrapolation of the futures prices. Since this does not require modeling the buying/selling of VIX futures contracts there are no distortions due to contract rolls. The chart below shows the historical volatility (22 trading days) of the VIX index compared to the historical volatility of VXXB and my synthesized mix of first and second month (M1/M2) VIX futures that I believe corresponds to a 60-day expectation of volatility. My synthesized values match up well with VXXB’s actuals. It is interesting that VXXB’s huge contango costs don’t show up in this chart. 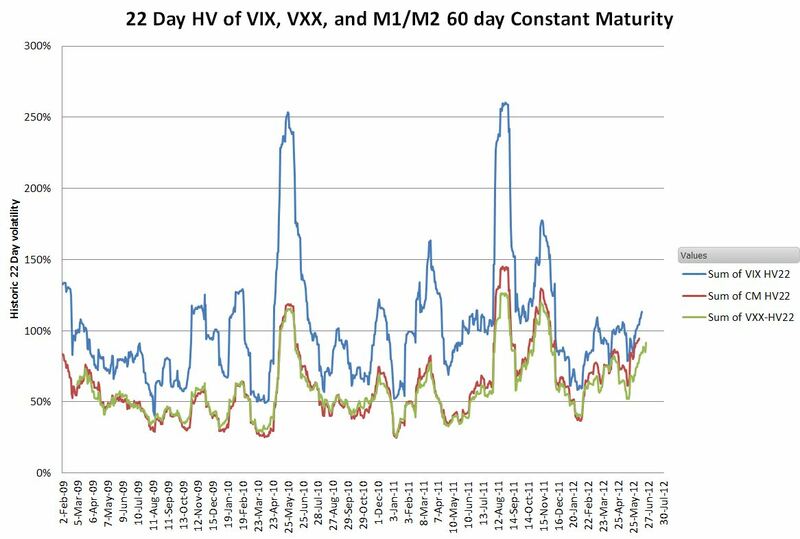 The average of VXX’s historical volatility since January 2009 has been 58%—compared to 102% for VIX. Next, I shifted my synthesized mix of M1/M2 futures to closely match the true 30-day expectation of VIX. My simulation uses a linear extrapolation of the VIX term structure, rather than an exponential match, so I expected extreme volatility events to be understated. But in quiet times the match between the VIX index and my true 30-day maturity mix of VIX futures is often quite good. I think Barclays’ stated “constant weighted average maturity of one month” is a month shy of reality.